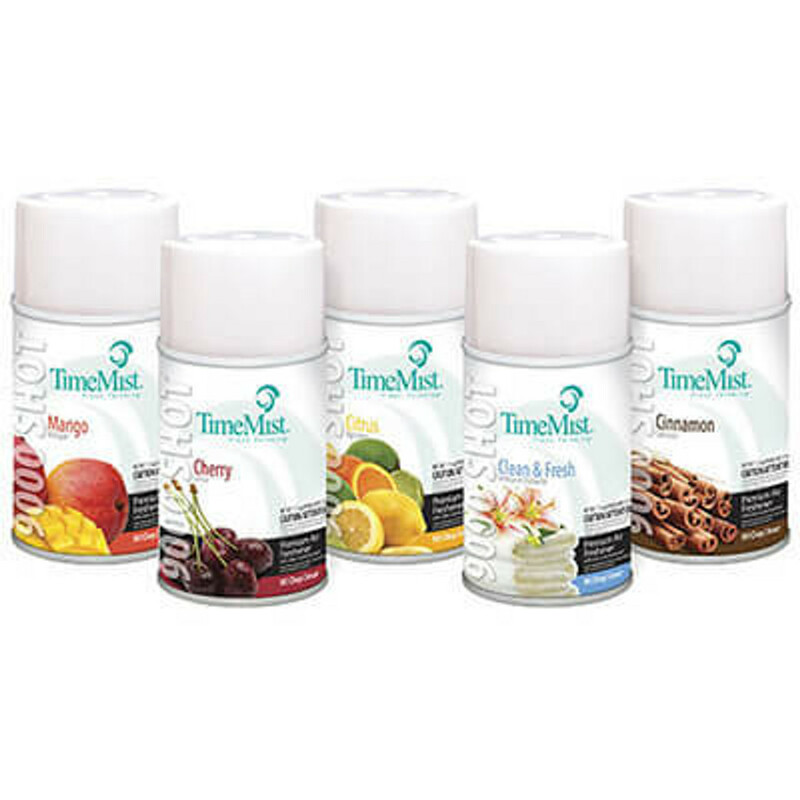 Get the biggest value for your money with TimeMist 9000 shot air freshener refills. These refills are compatible with the standard TimeMist classic metered aerosol fragrance dispenser. Enjoy 90 days inviting fragrance dispensed every 15 minutes for ultimate freshness in your home or commercial areas such as offices or bathrooms. The 9000 shot aersol refills contain odor counteractants to eliminate offensive odors instead of masking them. Everybody likes to have pleasant fragrance on their premises. The only thing which they are put off by more is the high cost of fragrance refills. Since the fragrance refills will be needed on a consistent basis, the costs can stack up easily. However, with the TimeMist 9000 Shot Refills, this problem will be a thing of the past. The refill can easily last for 90 days. With a 15-minute usage frequency, you can make it last for 3 months which ensures that you do not have to worry about refilling them again and again. There are plenty of reasons why you should go for the TimeMist 9000 Shot Refills. Owing to the high number of choices, you will be able to easily select the one which you prefer the most. When you buy any of these refills, you do not have to worry about replacing them before 3 months. When used in the standard configuration that is with 15-minute frequency usage, you do not have to worry about replacing them again and again. This is an added advantage as it keeps your costs under control. Moreover, lesser refills of fragrance shots means that less packaging waste is generated. Thus, you will be able to use the shots in a completely eco-friendly manner. Many of the other fragrance refills will just to mask the odor. The problem is that within the short intervals when the fragrance is not being released, the odor will return. On the other hand, when you look at these fragrance shots, you will realize that they entirely eliminate the odor. When the odor is eliminated, you can easily use them at a frequency interval of 15 minutes. This means that you will not have to use them on a consistent basis. As a result, it will last for a longer period of time. This will mean that you do not have to worry about the cost when you’re using the shot refills. These fragrance shot refills are VOC compliant in most of the states. This ensures that the needs of the customers are taken into account. Whether you look at the specifications of the shot refills which the customers need or whether you look at the intensity of the fragrance which the customer needs, all of this is taken care of. As a result, when you’re buying the shot refills, you do not have to worry about any aspect not being up to the mark.